CDS and Maintenance are integral to prolonging equipment life and ensuring patient safety. 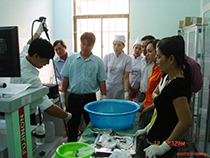 Therefore, these trainings must be reinforced regularly to current and new heathcare providers. We conduct regular nurse trainings on a wide variety of topics. To attend these trainings, please contact our Sales or Service representives to enrol.